When the iconic Dutch furniture designer Gerrit Rietveld envisioned building a chair out of one sheet of plywood in 1934, building one was out of reach for someone with a small shop and the original drawings use solid wood bolted together. Now you can build your own, strong, comfortable version in a matter of hours. 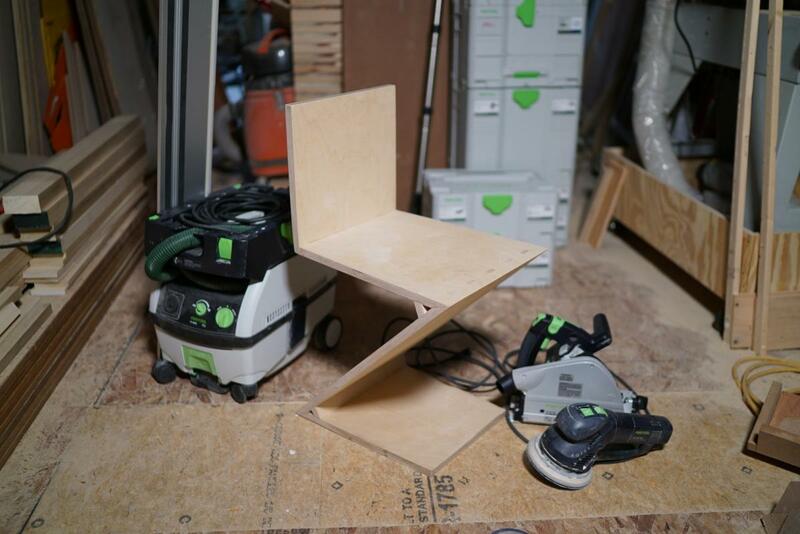 In this class beginner and intermediate woodworkers will use the Festool system of tools to turn high quality Europly plywood into this masterpiece of modern minimalism. All tools will be provided. Each student will leave with a completed chair ready for finishing. This is a wonderful opportunity to not only build a really comfortable chair but learn about precise cutting and assembly of sheet goods using the latest in portable power tool equipment. This is a limited enrollment, hands-on class. Class participants must bring or purchase safety glasses or goggles, ear protection, and sign a safety waiver. Click here for more information and to register for the class. Cost: $200 instruction fee + $70 materials fee. All tools and materials included. Parking is available in front of our shop and under the expressway. The subway (R train to 25th street in Brooklyn) is a few blocks away.